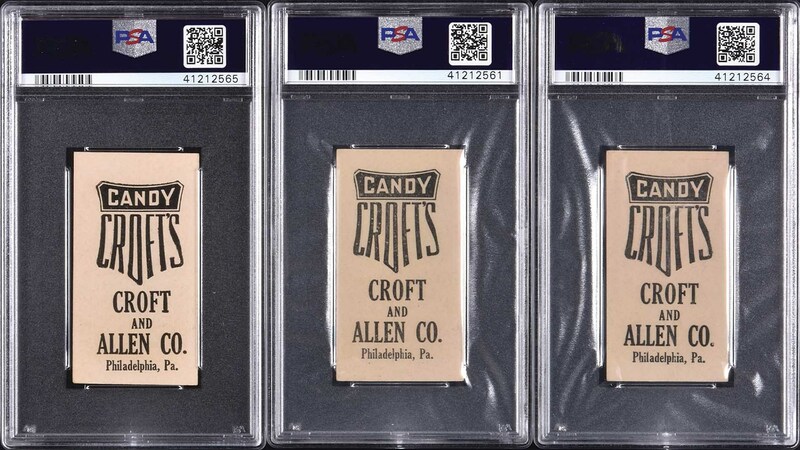 Outstanding high-grade trio of cards from the 1909 E92 Croft's Candy set, each graded and encapsulated EX-MT 6 by PSA (all submitted by REA). Cards from the E92 set were issued with four different advertising reverses (Dockman Gum, Nadja Caramels, Croft's Swiss Milk Cocoa, and Croft's Candy). Each of these cards has advertising for Croft's Candy on their reverses. The fact that the advertisement refers to a specific Philadelphia location suggests a very regional distribution, and this no doubt accounts for their rarity. The lot consists of the following: Fred Jacklitsch, Hans Lobert (only example graded by PSA), and Admiral Schlei (highest graded, pop 1). The offered examples are all bright and fresh, with brilliant colors, and four strong corners. Perfectly clean and boldly printed reverses. Caramel cards, because they were issued with candy, one card per package, did not easily escape damage or hold up well to wear over the years. EX-MT 6 is an outstanding grade for a caramel card! 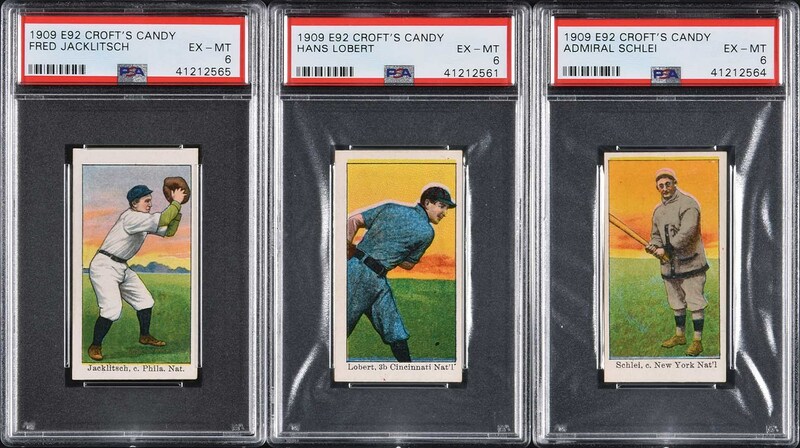 A tremendous group of three high-grade cards from one of the most popular, elusive, and colorful of all “E” card issues. Total: 3 cards. Reserve $300. Estimate (open).